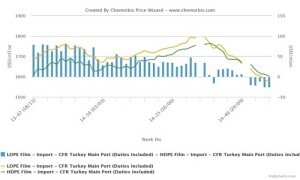 A downward trend has been in place in major PE markets for at least three months in Asia and the Middle East while the European PE market has been on a downturn since early July as per the pricing service of ChemOrbis. During this period, LDPE appears to have lost its traditional premium over HDPE in Europe and the Middle East. The Chinese market, meanwhile, has already seen LDPE trade at similar levels to HDPE for most of 2014. According to ChemOrbis, in China, LDPE’s traditional premium over LLDPE and HDPE film has been erased for much of 2014. 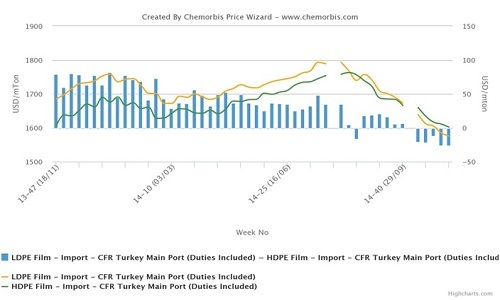 Having been traded with a premium of more than $100/ton in the last quarter of 2013, LDPE prices gradually lost ground in the first few months of 2014 while HDPE film was only slightly softer, as can be seen from the graph below. This caused the premium LDPE carries over HDPE film to shrink or even to be lost. The two products have been trading almost at equal levels on average or with only slight differences in the import PE market since the beginning of the second quarter of this year.